McConnell: GOP Won't Be "Reduced To Being Tax Collectors For The Obama Economy"
"I was truly hopeful that the President could be persuaded to view the upcoming debt limit vote as an opportunity to cut Washington spending and the debt that has ballooned since he took office, and to preserve entitlements at the same time. But in the end, he just wasn't interested in doing something of that magnitude that would pass. He really gave us three bad choices: higher taxes, smoke and mirrors, or default. And we refuse to accept any of them. Republicans not be reduced to being the tax collectors for the Obama economy. We won't be seduced into calling a bad deal a good deal. And we won't let the White House fool around with the full faith and credit of the United States. If the President wants to threaten seniors or veterans or rattle the world economy by pretending he can't pay our bills, he of course can do that. 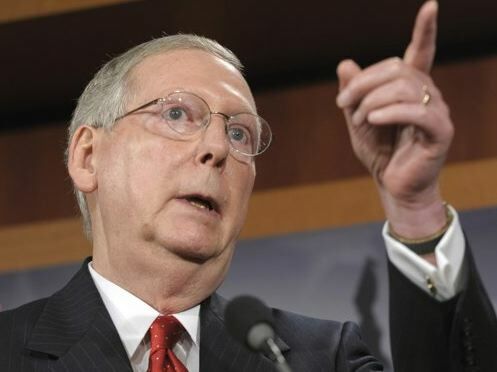 But he is not going to implicate Republicans in these efforts," Senate Minority Leader Mitch McConnell said. Palin On Debt: "Not The Time To Retreat, Time To Reload"
Sen. Toomey: "We're Living On Borrowed Time Fiscally"